The dynamics of modern ice sheets, and the nature of their spatial and temporal variability in flow, are important to our understanding of the high-latitude marine sedimentary record. This is because the flux of ice, and any associated meltwater and sediment load delivered to the adjacent ocean, will vary significantly depending on the ice-flow regime. The large-scale form and flow of contemporary ice sheets and large ice caps have been examined using a variety of satellite and airborne remote-sensing systems. Ice-surface features indicative of flow dynamics can be observed at the resolution of a few tens of metres over vast areas of icesheet interiors (e.g. Bindschadler et al., 2001b). Satellite radar altimeters can measure ice-sheet surface elevation to a few tens of centimetres, and SAR interferometry allows the calculation of ice velocity, also at synoptic scales (e.g. Wingham et al., 1998; Joughin et al., 1999). When ice-surface topography, surface features and velocity structure are mapped over large areas of Antarctica and Greenland, it has been shown that the ice sheets exhibit two basic modes of flow. A smooth and unbroken ice surface is indicative of slow ice flow, whereas rougher and often heavily crevassed ice with abrupt lateral margins defines areas of fast flow. These fast-flowing features, known as ice streams, are up to tens of kilometres in width and penetrate from the coast up to several hundred kilometres into the ice-sheet interior. Altimetric data show that they drain very large interior basins of up to 104km2 in Greenland and 106km2 in Antarctica (Joughin et al., 1997; Bamber et al., 2000a). Ice-surface velocities range from hundreds to thousands of metres per year in ice streams, whereas the smooth topography beyond the boundaries of fast flow often has velocities of only a few metres per year. These two modes of flow are typical not only of the great ice sheets, but also of the many large ice caps in the island archipelagos of the Arctic (e.g. Dowdeswell et al., 1999a, 2002a). also has been observed in Greenland outlet glaciers, such as Storstrommen (Reeh et al., 1994). In this case, glacier surging appears to have taken place, whereby a few years of fast flow punctuate much longer periods of stagnation. The nature of the ice-sheet terminus where it reaches high-latitude seas also varies. The margin may be either grounded or floating. Mass loss from grounded margins (known as tidewater margins) is in the form of iceberg production and the release of any meltwater at terminal ice cliffs. By contrast, floating margins, known as ice shelves (or ice tongues where they are long relative to their width), allow the penetration of marine waters into the cavity beneath. 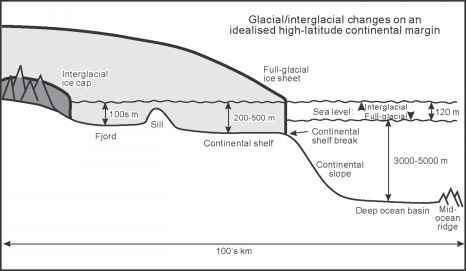 The cavity can be hundreds of metres deep and extend from tens to hundreds of kilometres upstream to the grounding zone, where ice rests directly on a sedimentary or bedrock substrate. The grounding zone, and the base of floating ice shelves particularly close to this zone, are important areas of mass loss and sediment delivery by melting, in addition to the calving of icebergs at the ice-shelf edge. Large ice shelves, exemplified by the Ross, Ronne and Amery ice shelves of up to 105 km2, are present today only in Antarctica; ice is about 300 m thick at the ice-shelf edge and often over 1000 m thick at the grounding zone. Smaller fringing ice shelves and glacier tongues also occur elsewhere in Antarctica and at the margins of fast-flowing outlets of the Greenland Ice Sheet; several Greenland outlet glaciers have floating tongues of about 500 m in thickness (e.g. Olesen & Reeh, 1969; Mayer et al, 2000). Such variations in the nature of the ice-ocean interface contribute to the observed patterns of glacier-influenced sedimentation on high-latitude margins.